When a body pops up on the glaciers of Antarctica, U.S. Marshal Carrie Stetko (Kate Beckinsale) suspects a murderer is hiding among the small number of scientists and researchers who man the polar station. With the winter storms closing in, Stetko and a small team must race against the clock to solve the murder before they're snowed in for six months. Movies like "Whiteout" are the reason why HBO still exists. No amount of money could have gotten me to see this movie in theaters. And I wouldn't pay to rent it either, even in a pitiful movie year like this one that has forced me into numerous poor decisions. But if it pops up on HBO on a night when the Rangers have extended their losing streak, I've already watched Sportscenter twice, and I've got some busy work to do? Sure, I can watch it then. And you know, in all honesty, "Whiteout" isn't nearly as bad as I thought it would be. It's far from what I would call a "good" film but completely undeserving of the critical BEATING it took when it was released this time last year. It's very paint-by-numbers and the special effects are laughable, sure, but as far as Tuesday night time wasters go? Not all that bad. The plot is (obviously) quite easy to follow, the action moves along at a brisk pace, and most importantly, "Whiteout" doesn't try to be anything it isn't. Most movies like this either attempt to force themselves into the realm of the "significant" or they dredge themselves in gore. This sucker does neither and for that, I commend its makers. 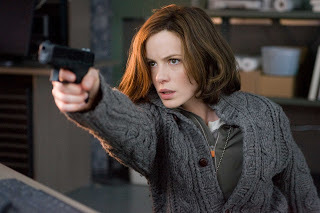 "Whiteout" did, however, reawaken my desire for Kate Beckinsale to matter. She's an incredibly beautiful woman, sure, but I really think she's a talented actress who has gotten herself stuck in a bad rut. She's been pigeon holed into this type of future SyFy channel filler and her career is now on the brink of becoming irredeemable. Regardless, "Whiteout" isn't as bad as you think it is and serves as a half way decent time killer on a rainy weeknight.